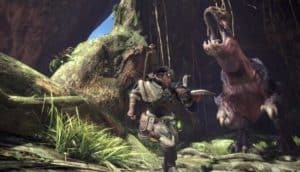 Monster Hunter: World Beta Starts December 9 | Nerd Much? The beta does not give you access to the full game. If you are lucky enough to be a PS Plus member, you can take part in the Monster Hunter: World beta starting on December 9 at 9pm PT and ending December 12 at 8:59am PT. You can download the beta in advance on December 8 for those that want to jump in as quickly as possible. The game file size is 5.1 GB, so make sure you’ve got the space in case your digital library is a little full on your PS4. The beta does not give you access to the full game, of course, but it will include three quests that feature two environments, the Ancient Forest and the Wildspire Waste. You will encounter a variety of monsters like the Great Jagras (found in the Ancient Forest), Anjanath (Ancient Forest), and Barroth (Wildspire Waste). You can take on these quests in single player, or you can take with you up to three other friends. If you happen to be new to the series, the beta will give you access to a training room (a new feature for Monster Hunter). There you can try out all fourteen different weapon types, from two-handed swords to lances that allow you to poke monsters from afar. If they get too close, at least one of these lances provides a shield as well. If you would like to keep any of the rewards you earn while playing the beta, make sure you’re signed into the Sony Entertainment Network while playing both the beta and the full game. These rewards include face paint (purely for aesthetics and does not provide any skill bonus), lifepowker, max potions, shock traps, and plenty more supplies that can be transferred to the full game if you decide to purchase it. Monster Hunter: World will be launching in full on January 26, 2018 for the PS4, and Xbox One, with a PC version coming later in the year. Are you looking forward to Monster Hunter: World? Which weapon will you choose this time? Let us know in the comments below!